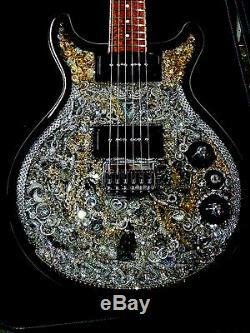 This is a one of a kind, completely custom electric guitar that has been created by Master Luthier Craig O'Donnell out of Australia. The guitar has been dubbed'The Swan', as it features the well known Swarovski Swan logo on the body in between the pickups. In this case, the logo is two swans face to face. This can be seen in one of the pictures that accompanies the listing. 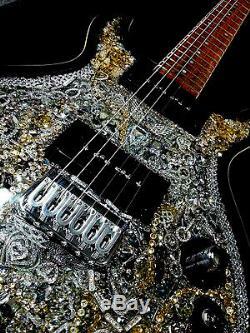 Craig O'Donnell has created a brand new technique to inlay the Swarovski jewelry into the guitar body. This is a brand new method, first of its kind for this one of a kind guitar. This method has been named Resin Suspended System or RSS for short. 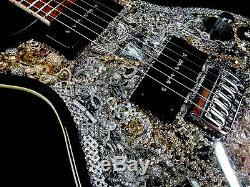 The jewelry does not sit on the guitar body whatsoever. It is literally inlaid into the body with a coat of resin on top. This gives the guitar a perfectly smooth finish. Which allows fluid action when playing. 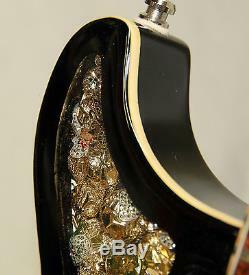 If you look at any other guitar out there has has been adorned with any jewels or crystal, you will find that they are always glued onto the body. What Craig has created with his RSS system is completely unique. Includes a brand new Hiscox guitar flight case. The guitar fits into the case perfectly and is well protected for any type of movement. Brand new and totally playable. We will be uploading a video to show what it sounds like. For now, there are more pictures in the slideshow below. Neck - 3 piece Mahogany and Maple. Fretboard - Silky Oak 12 degrees radius. 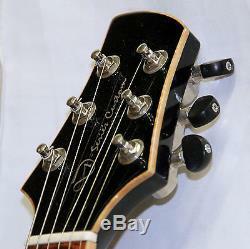 Tuners - Grover with ebony knobs. P90s Hand-wound ODonnell guitars 9.0k bridge & 8k neck, with scatter winding as well as AWG42 wire wax potted, Alinco 5 magnets with Braided single coil conductor lead wire. Paint - Nitrocellulose gloss finish. Weight - 6.22kg / 13.71lb. We look forward to hearing from you! 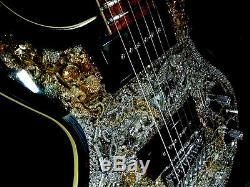 The item "One of a Kind Collectable Swarovski O'Donnell Custom Electric Guitar The Swan" is in sale since Thursday, June 16, 2016. This item is in the category "Collectibles\Decorative Collectibles\Decorative Collectible Brands\Swarovski\Other Swarovski". The seller is "bassox333" and is located in Toronto, ON. This item can be shipped worldwide.